Outdoor Wood Furnaces: 2010 Census Shows Wood is Fastest Growing Heating Fuel in U.S.
2010 Census Shows Wood is Fastest Growing Heating Fuel in U.S. In two states, households using wood as a primary heat source more than doubled -Michigan (135%) and Connecticut (122%). And in six other states, wood heating grew by more than 90% - New Hampshire (99%), Massachusetts (99%), Maine (96%), Rhode Island (96%), Ohio (95%) and Nevada (91%). "Heating with wood may not be hip like solar, but it's proving to be the workhorse of residential renewable energy production," said John Ackerly, President of the Alliance for Green Heat, a non-profit organization based in Maryland. "The rise of wood heat is good news for offsetting fossil fuels, achieving energy independence, creating jobs and helping families affordably heat their homes," said Mr. Ackerly. 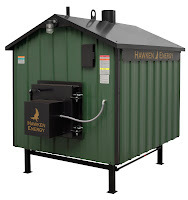 "However, Wood heat's rapid rise is not just from people using clean pellet and EPA certified wood stoves. Many people are also dusting off old and inefficient stoves and in some states installing outdoor boilers that create too much smoke," cautions Ackerly. Over the last decade, the numberhouseholds using two of the most expensive heating fuels significantly declined: propane dropped 16% and oil heat dropped 21%. Some of those homes undoubtedly switched to wood. Switching from fossil fuels to commercially purchased wood can reduce a homes heating bills by half or more. Those who cut or collect their own wood save much more, using their labor to zero out heating bills. Currently about 25 - 30% of the 12 million stoves in the US are clean burning pellet stoves or EPA certified wood stoves, according to the EPA and other sources. Americans have installed about one million pellet stoves since the 1980s when they were invented. or 2,382,737 households, use wood as a primary heat source, up from 1.6% in 2000. About 10 - 12% of American households use wood when secondary heating is counted, according to the US Census Bureau and the Energy Information Agency (EIA). Click here for additional details and analysis on wood heat in the 2010 census. For more information like this visit the Alliance for Green Heat Homepage. Or sign up for their newsletter.